Some blockages don’t want to budge with traditional means. These drain and sewer blockages are often one of the most frustrating plumbing problems that a homeowner or business owner deals with. High pressure water jetting is the ideal method for removing blockages that cannot be removed otherwise. What Is High Pressure Water Jetting? High pressure water jetting is a technique that was developed in the 1950s and has varies ways of being used. Some water jetting systems are automated with computers, while others use basic components like pressurized hoses. Many industries are using high pressure water jetting as a means of cleaning off machinery and other procedures. It’s not just for plumbing. This liquid can be pure water, water mixed with abrasive materials, cleaning solutions, or other added chemicals. Because of this, you might also see “pure water jetting” or “abrasive jetting” used. High pressure water jetting helps to clean the surfaces and power through tough build-up and blockages in a drain system. For plumbing, it doesn’t matter what type of drain or sewer line—municipal, commercial, or residential—because the pressure and stream can be adjusted to fit the job. Drains and pipes will usually clog when sources of blockage, like grease, leaves, debris, hair, sand, roots, and sludge get piled up inside the pipe line. Naturally, this also helps with smoothing uneven surfaces and old coats of paint to help prepare for renovations. 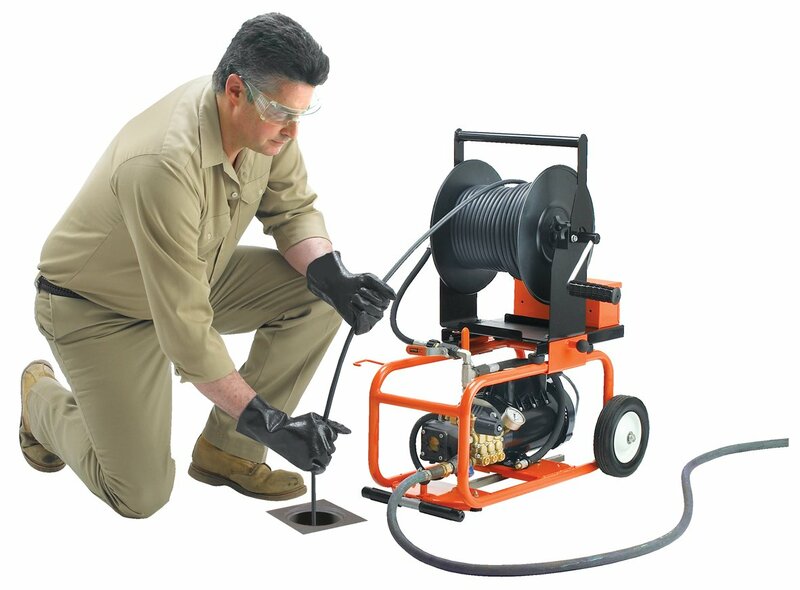 As a more environmentally-friendly and quieter alternative to jackhammers, high pressure water jetting can be used at construction sites to help with the cutting and removal of stone, concrete, brick, and other hard surfaces. Because high pressure water jetting is ideal for breaking up clogs and removing coats of sludge from pipe walls, it is also an excellent choice for yearly preventative maintenance. High pressure water jetting doesn’t require harsh or hazardous chemicals to be effective, meaning it’s an eco-friendly move and also affordable. High pressure water jetting can work like lasers when the nozzle is set just right. Doing so results in the ability to carve shapes or, when heated to a certain point, the ability to cut plastic, stone, bronze, brass, and even Teflon. In short, high pressure water jetting is a budget-friendly choice for removing tightly packed blockages in your residential or commercial plumbing. Whether you have blockages created by sediment, sand, or ice, our professional team can cut through the hindrance to get your pipes and drains working optimally again. want to discuss any questions or concerns that you have with your plumbing system, please don’t hesitate to contact us at the Irish plumber team, we will be more than happy to help. Water in Your Basement or Flooding Due to Snow Melt? Why Does The Toilet Whistle After Flushing?